The Kingston DataTraveler R3.0 USB 3.0 64GB averaged 76.2% lower than the peak scores attained by the group leaders. This isn't a great result which indicates that there are much faster alternatives on the comparison list. 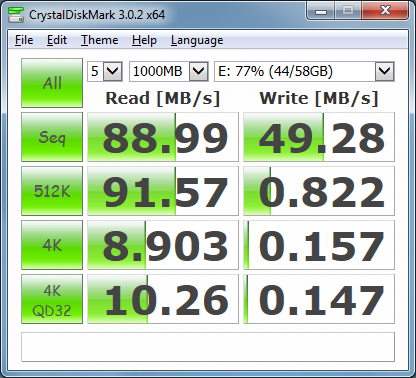 The range of scores (95th - 5th percentile) for the Kingston DataTraveler R3.0 USB 3.0 64GB is 28.7%. This is a relatively narrow range which indicates that the Kingston DataTraveler R3.0 USB 3.0 64GB performs reasonably consistently under varying real world conditions.